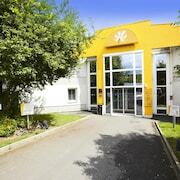 This hotel is in Magny-le-Hongre, 3.9 kilometers from Disneyland® Paris. If you're looking for a great (and cheap!) hotel in Paris, CheapTickets is the best place to find them. 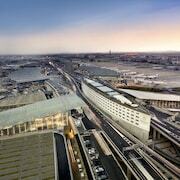 We offer deals on the best 2750 hotels throughout Paris. No matter what you're looking for, we have options for you. Grab great rates on the 905 affordable 3-star hotels that are easy on the wallet without sacrificing comfort. Looking for more luxury? Try one of the 542, 4-star hotel accommodations in Paris. No matter your budget needs, we've pulled out all the stops to make sure you have plenty of vacation options. Maybe you prefer to search for your hotel deals based on what each hotel offers? For example, let's say you just want to find a hotel or resort that has a pool to cool off in after a long day exploring Paris. 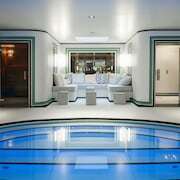 Scroll down to choose from the 134 hotels in Paris that has a pool for guests. Or search for deals on Paris hotels offering free wifi or breakfast, non-smoking rooms, and more! CheapTickets is here to be your personal travel agent for your next trip to Paris. Get booking today! What hotels in Paris offer free wifi access? Are there deals on Paris hotels offering free breakfast? Yes! The only thing better than finding a great deal on a cheap hotel in Paris is finding one that offers free breakfast. Grab some eggs, a waffle, or some healthy oatmeal before a day full of exploring Paris and all that it has to offer. Below are just some of the many hotels that offer free breakfast in Paris. West End Hotel is a 4.00 star rated hotel property in Paris that offers free breakfast. Mercure Paris Centre Tour Eiffel is a 4.00 star rated hotel property in Paris that offers free breakfast. 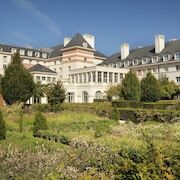 Saint James Albany Paris Hôtel Spa is a 4.00 star rated hotel property in Paris that offers free breakfast. Hotel Brighton is a 4.00 star rated hotel property in Paris that offers free breakfast. What about deals on pet-friendly hotels in Paris? Paris is a great place to get outside and explore with your pets in tow so don't leave your furry friends behind. Below you'll find great deals on hotels in Paris that allow pets. Don't forget to bring plenty of treats! Hotel De Buci by MH is a popular, pet-friendly, 4.00 star hotel in Paris. Lenox Montparnasse Hotel is a popular, pet-friendly, 3.00 star hotel in Paris. Vienna House Magic Circus at Disneyland ® Paris is a popular, pet-friendly, 4.00 star hotel in Paris. Aparthotel Adagio Paris Centre Tour Eiffel is a popular, pet-friendly, 4.00 star hotel in Paris. Any good rates on Paris hotels with restaurants? Absolutely. Don't want to deal with planning our all your meals on your trip to Paris? We don't blame you. Keep the hangry away by staying in one of the 380 hotels that have restaurants. With a room at one of these spots, all it takes to get a good meal is hopping in the elevator. Check out some of the most popular hotels in Paris that have restaurants below. Book Hyatt Regency Paris EtoileHyatt Regency Paris Etoile is a 4.00 star hotel and has one or more restaurant options. Book Pullman Paris Tour EiffelPullman Paris Tour Eiffel is a 4.00 star hotel and has one or more restaurant options. Book Hôtel WestminsterHôtel Westminster is a 4.00 star hotel and has one or more restaurant options. 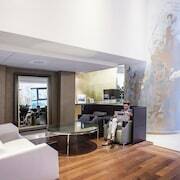 Book Novotel Paris Les HallesNovotel Paris Les Halles is a 4.00 star hotel and has one or more restaurant options. What are the cheapest hotels in Paris with pools? What's better after a long day exploring Paris then a relaxing dip in a pool? Finding the Paris hotel you need for a bargain! Cool off and unwind at one of our 134 Paris hotels with a pool. Browse some of the top deals on these hotels and resorts with pools in Paris below, but be warned: You may not want to check out! Les Jardins d'Eiffel has a pool and a 3.00 star rating. Paris Marriott Opera Ambassador has a pool and a 4.00 star rating. Citadines Apart'hotel Saint-Germain-des-Prés Paris has a pool and a 4.00 star rating. 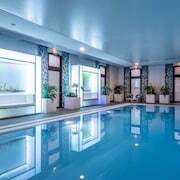 Novotel Paris Les Halles has a pool and a 4.00 star rating. What hotels in Paris offer parking for guests? Once you've made your way to Paris, the last thing you want to deal with is finding parking close to your hotel. Avoid the hassle of parking around the block and carrying your luggage all the way to the lobby by booking one of our hotels with parking. Check out deals on some of the 963 hotels in Paris that offer parking for guests. Hotel Ampere This hotel has a 4.00-star rating. Relais Bosquet This hotel has a 3.00-star rating. Le Derby Alma This hotel has a 4.00-star rating. The Westin Paris - Vendôme This hotel has a 4.00-star rating. Do Paris hotels offer 24-hour concierge services? When you're on vacation, things don't always go according to plan. Travel with peace of mind when you book one of our 845 hotels in Paris with 24-hour concierge service. That way you know help is always phone call or elevator ride away. Try Hôtel De Varenne. It's a 4.00 star rated hotel in Paris that offers concierge services 24 hours a day. Try Citadines Tour Eiffel Paris. It's a 4.00 star rated hotel in Paris that offers concierge services 24 hours a day. 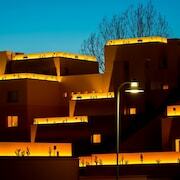 Try Hotel du Cadran. It's a 3.00 star rated hotel in Paris that offers concierge services 24 hours a day. Try Hotel Wilson Opera. It's a 3.00 star rated hotel in Paris that offers concierge services 24 hours a day. What about low rates on non-smoking hotels in Paris? Hotel Eiffel Seine This hotel has a 3.00-star rating. Paris Marriott Opera Ambassador This hotel has a 4.00-star rating. Novotel Paris Les Halles This hotel has a 4.00-star rating. Citadines Apart'hotel Saint-Germain-des-Prés Paris This hotel has a 4.00-star rating. What are the cheapest Paris 3-star hotel deals? Our 3-star hotels bring you quality accommodations at a lower price point for the perfect, budget-friendly vacation in Paris. With 905 3-star hotels throughout Paris to choose from, you still have options. Browse our selection below. Explorers Hotel at Disneyland® Paris. 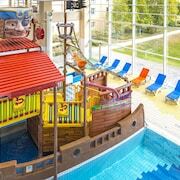 This hotel is located in Magny Le Hongre, eight minutes by shuttle from Disneyland® Paris, Walt Disney® Studios Park, the Disney Village® entertainment complex, and the TGV and RER train station. Hôtel 34B - Astotel. Located in 9th Arrondissement, this hotel is within a 15-minute walk of Le Palace Theatre, Galeries Lafayette, and Paris Opera. Forum des Halles and Palais Royal are also within 1 mi (2 km). Hotel du Cadran. This contemporary Paris hotel is located 1 block from the Rue Cler market; it is 2 blocks from both Les Invalides, where Napoléon is entombed, and the Champ de Mars, the park surrounding the Eiffel Tower. Hotel Wilson Opera. Located in 8th Arrondissement, this boutique hotel is within a 15-minute walk of Printemps Department Store, Paris Opera, and Galeries Lafayette. Parc Monceau and Moulin Rouge are also within 1 mi (2 km). What are the best deals on 4-Star Hotels in Paris? Paris is full of hotels and it can be hard to narrow down where you really want to stay. Luckily, we've done that hard work for you be narrowing you from 2750 hotels throughout Paris, to the 542 4-star hotels in Paris. Our 4-star hotels in Paris are exactly what you need for your next family trip, romantic weekend, or solo getaway. Check out our most popular deals below. Pullman Paris Tour Eiffel: The 4-star Pullman Paris Tour Eiffel has a unique location by the Eiffel Tower and the Trocadero. Totally renovated in 2014, it offers easy access to the Champs-Elysées, the Louvre, Invalides, Champs de Mars, and the Saint-Germain-des-Prés district. Citadines Apart'hotel Saint-Germain-des-Prés Paris: Located in Quartier Latin, this residence is steps from Hotel de la Monnaie and Pont Neuf. Notre Dame Cathedral and Sainte Chapelle are also within 10 minutes. Mercure Paris Centre Tour Eiffel: Mercure Paris Centre Tour Eiffel is less than a 5-minute walk from the Eiffel Tower and the Seine. The Louvre and Jardin du Luxembourg are both about 15 minutes by subway. Paris Marriott Opera Ambassador: This updated Paris hotel is three blocks from Opéra Garnier, Galeries Lafayette, and Drouot Auction House, and within 1 km of le Moulin Rouge. What are the best activities to do in Paris? Paris Day Trip by Eurostar with Seine River Cruise & Eiffel Tower Lunch: Starting at just $327 per person. Paris Day Trip via Eurostar with Open-Top Bus Tour: Starting at just $247 per person. Paris Full-Day Tour with Palace of Versailles: Starting at just $426 per person. Independent Paris Day Trip via Eurostar: Starting at just $221 per person. the body lotion is really bad I had forgotten my lotion and used what was provided from the Hotel and it's of extremely low quality for the hotel of this caliber. If you can do better on that front I think that would be great. The hotel is conveniently located 15-20 min walking distance from the majority of Paris landmarks, and museums. The hotel is sorrounded by an excellent choice of restaurants. The staff is helpful and friendly. The hotel is very comfortable, clean and convenient. Definitely will stay again at this location! bought plane ticket thru cheaptickets.com, for Jan.9,2019, deal was better with room and car...this hotel came up...I selected them.... in my opinion the rooms are like camper accommodations. The bathroom is so small and cramped, just like a camper. the window had black mold all the way around it...when I asked if that was normal, the guy said it is just the time of year... the room came with 1 bath towel, and 1 trash can. the only soap was in a dispenser in the tiny shower, no bathmat to dry the flooded floor from the shower. they only have full and or twin beds. My room had a full with a twin bunk bed over the full, never saw anything like this except in a camper maybe..I think hit my head on the bunk at least once a day.... parking was 6 euros a day... they had a continental breakfast that was 5.60 euros a day... I have stayed in hotel/motels everywhere....this is my first trip to France....could not believe the differences. I guess saving money cost me the comfort I am used to. Will not go back there again.